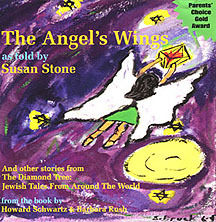 CD of Jewish tales from Folklore, Talmud, Midrash with music. 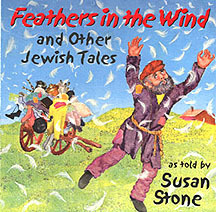 CD of eight Jewish mystical and folk tales for children ages 5-10, enhanced by lively original musical accompaniment. Feathers in the Wind: A Jewish American’s Story is part of Race Bridges for Schools. Yom Kippur Readings edited by Dov Elkins with the story by Susan Stone: “The Capture and Release of the Evil Inclination”. The Voice of Children: A Siddur for Shabbat edited by Rabbi Sandy Sasso and Rabbi Jeffrey Schein, with the story “Ir Hamshochim” by Susan Stone. Journeys to a Jewish Life: Inspiring Stories from the Spiritual Journeys of American Jews by Paula Amann, 2007.